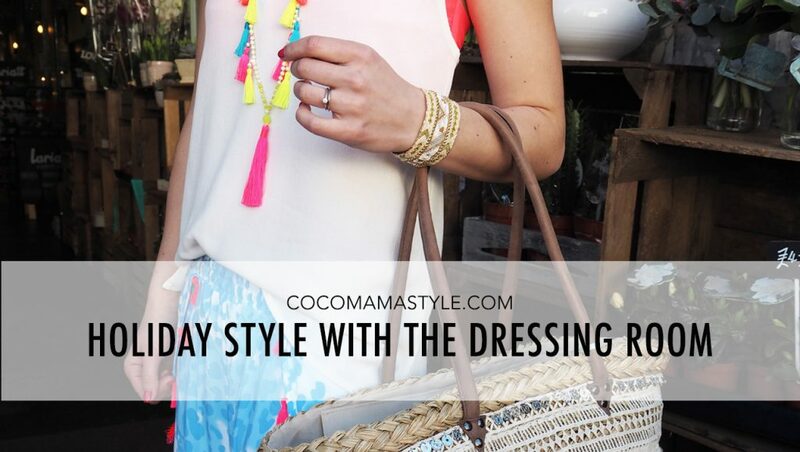 Over the past 5 years of cocomamastyle.com (a whole five years! ), I’ve collaborated with The Dressing Room boutique several times and this month I finally took the (very short!) journey to St Albans to visit the store where I was invited to style and wear some outfits from the newly dropped holiday collections. With some of my favourite accessory brands and many clothing labels I’d coveted but not tried before, I was in holiday fashion heaven. Most of the collections in store are available online but if you’re near Herts or even further afield (it’s easily accessible) The Dressing Room store is a must visit. View The Dressing Room’s lookbook here and see below for my thoughts on each outfit with links to all the items. For me, holiday dressing is about crisp whites paired with bright tones in light layers for easy, beach to dinner style. Throw a simple cami and luxe beach pants over a neon bikini, add a statement necklace and straw tote and wedges and you’re presentable for lunch, a walk in the local town or dinner. These supersoft trousers are a top alternative to the maxi skirt for covering up a little while staying practical for mum-duty. Muted tones and metallics make for easy capsule wardrobe dressing during the summer especially when you’re packing light. When the colour palette is limited you can feel confident to be more adventurous with mixing prints as they blend in to one another. Add washed out denim shorts for practicalities and add rose gold accessories for a polished finish. A lightweight jumpsuit is just the ticket for high summer and warm climates. Think cool, light fabrics with shoulder coverage to avoid too much sun on your upper arms – pink may be a big trend this season but lobster-toned skin is never a good idea. With a relaxed fit on the top and legs, look for waist detail to shape your silhouette. The two layer top part of this jumpsuit fits like a dream with a tailored and ruched bottom layer to hold you in with a sheer, draped top layer to finish. If you’re heading for the sun it’s the perfect excuse to go kaleidoscopic with your outfit; bright digital prints worn with sparkling sequins make for a fun summer look. 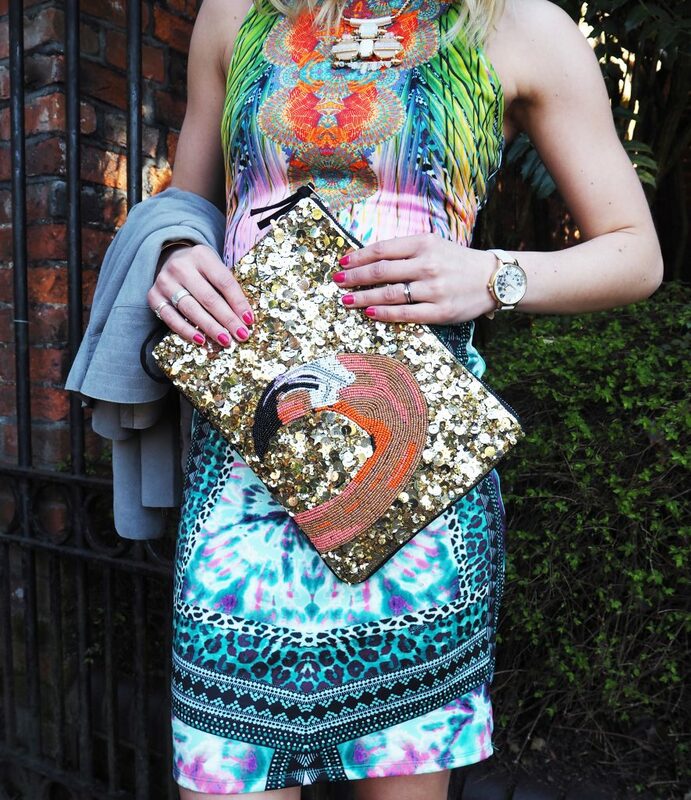 When your dress is this bold don’t feel you have to keep accessories neutral – make a style statement. And the fabric of this frock; silky smooth but high in stretch and just the right thickness to smooth your silhouette. I couldn’t finish without styling up one of Lily and Lionel’s maxi dresses which have been an insta-hit with those in the fashion know for a while now. Don’t save the maxi dress solely for the beach or high summer because the long sleeve printed maxi is a great everyday update to your wardrobe. Wear with a leather jacket and block heel ankle boots or sandals and you’re all set.